The druzy gemstone's unique texture is created by tons of tiny crystals forming on top of the stone. 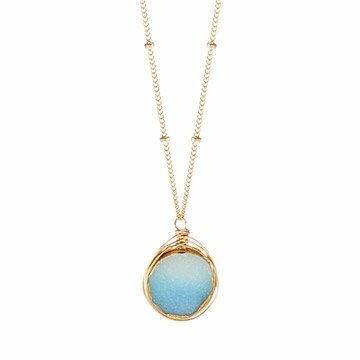 This serene aqua druzy pendant's intriguing glimmer and textured look radiates natural elegance. The druzy gemstone's unique composition is created by tons of tiny crystals forming on top of the stone, and it's surrounded in this piece by a gold-filled wire nest hand-wrapped by Laura Jackson. 18-inch gold-filled chain. Handmade in Pennsylvania. Make it a set! Click here to see the matching Wire Wrapped Druzy Earrings. Great gift my wife loved it! I purchased this as a thank you for a good friend. The chain is delicate and pretty and the stone is subtle and bold all at the same time.